Let’s All Hate Toronto (Directors: Albert Nerenberg, Rob Spence, Canada, 2006): Let’s All Hate Toronto premiered tonight to a sold out audience at the Bloor Cinema in, well, Toronto. There was quite a buzz around this film. I was eager to see what people around the country had to say about Toronto and why they disliked it so much. 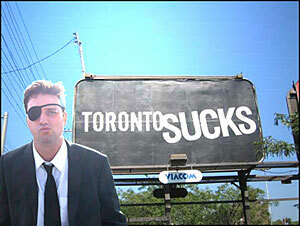 The film follows Mr. Toronto who travels across Canada to find out why everyone hates Toronto. To encourage feedback, Toronto Appreciation Days are ‘staged’ in public places which lead to some funny situations. By far, the funniest scene occurs in Edmonton last year, when the Edmonton Oilers made a run for the Stanley Cup. A drunken fan is waving a Toronto Appreciation Day banner. When he realizes what he has in his hands, he drops the banner as if it were on fire. The film tries too hard to be funny and it failed to keep my interest throughout. Maybe I was turned off by the staged events and some of the phoniness. The Mr. Toronto schtick gets tired halfway through and a lot of the footage is shown again and again. The best line in the film is “Toronto is like New York on dial-up“. Having been to New York I couldn’t agree more. Toronto is like a village compared to New York. As a Torontonian I had a very strong interest in seeing this film but when it comes to filmmaking, it’s a pretty average documentary. If I could have changed the channel, I would have flipped to something else. I hate to be negative about a local film because I know how much work and effort goes into making one but Let’s All Hate Toronto just didn’t do it for me. It raised a lot of interesting things about Toronto but overall it wasn’t compelling enough for this viewer. UPDATE: The film is having its official “premiere” at 9:30pm on Thursday June 28 at Toronto’s own Bloor Cinema (Bloor and Bathurst) and will play there through July 3. This entry was posted in Documentaries, Film Festivals, Hot Docs and tagged #hotdocs07, canada, Documentaries, Hot Docs, toronto. Bookmark the permalink. Thanks for the heads-up on this one, James. See you soon! Thanks, Al. I’ve added the link to the bottom of the review.